Pets play a greater role in our emotional and physical health than ever before, says the Purdue University professor who is co-author of his revised edition of Between Pets and People: The Importance of Animal Companionship. The book offers conclusive evidence from the two foremost researchers in the field, Alan M. Beck and Aaron H. Katcher, that animals have a significant influence on human life and health. Dealing with such varied topics as pet ownership and gender differences, the pet's freedom from social taboos, and pets' taking on roles of family members, the authors show that animal companionship affects, and is affected by, the most basic levels of human existence. Even how we name and feed our pets tells us about ourselves and our needs. Between Pets and People explores the emotional and physical benefits of owning a pet and analyzes the complex relationship between people and pets. "The study of the importance of the relationship between people and animals is a growing field and has the potential to be part of the whole human-health field," says Beck, director of Purdue's Center for Applied Ethology and Human-Animal Interaction. Beck and Katcher note a 1992 study by an Australian cardiologist of 5,000 people who visited a clinic to find ways to reduce heart disease. The study found that people with pets had lower blood pressure and lower blood fat levels than those without pets, even though the two groups were alike in diet and exercise. The authors also point to the trend by nursing homes to incorporate animals into the routine and environment for patients. In the early 1980s nursing homes typically did not allow pets to visit patients, while today nearly half of the homes have an organized program for animal therapy, Beck says. In addition to exploring physical benefits, the book covers such topics as pets as family members, pets as therapists, talking to pets, and how pets can teach us to become better companions to friends and family. The book also has a list of web sites by such organizations as Canine Companions for Independence and the American Kennel Club. Since the first edition of Between Pets and People in 1983, the authors' then-startling contention that pets benefit our mental and physical health has found wide acceptance. Evidence in our daily lives - in television pet food ads, in doctor's offices outfitted with aquaria - attests to how widely the belief in pets' therapeutic influence is now held. 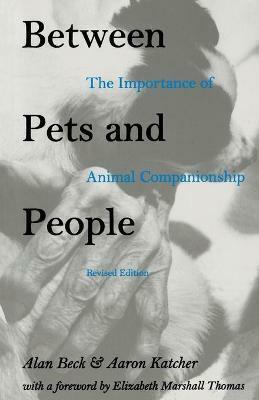 This revised edition of Between Pets and People, with additional data and case studies and expanded references - including a listing of Internet resources - and a foreword by Elizabeth Marshall Thomas, analyzes the surprisingly complex relationships we have with our pets. This book contains an important lesson for everyone - to accept ourselves and others in the uncritical way that pets accept us, and come to terms with our own animal nature. "Their interpretation may startle readers. . . . Clearly, humans need companion animals, and this book tells us why." Publishers Weekly "Mixed in with the ample case histories and statistics are a number of clear-cut, ponderable insights . . . a generally bracing as well as informing study." Dr. Alan Beck is the Dorothy N. McAllister Professor of Animal Ecology at Purdue University. Before coming to Purdue, Beck directed the Center for the Interaction of Animals and Society at the University of Pennsylvania and was director of animal programs for the New York City Department of Health. Aaron Katcher continues some work at the University of Pennsylvania veterinary school, but spends most of his time in research at the Devereaux Foundation in Brandywine, Pennsylvania. The foundation offers residential treatment of severely disturbed children.